ELLs are a diverse group of about ?ve million students in the U.S. who speak a primary language other than English and are not yet pro?cient in English. 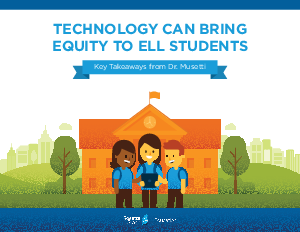 To catch and keep up with their native English speaking peers, ELLs need more instructional time and specialized instruction, including specially designed materials and advanced educational tools to accelerate their learning. Well utilized state-of-the-art technology tools can transform not only learning but academic success itself for ELLs and their families. To read the complete white paper and learn more about Rosetta Stone, go to k12hub.rosettastone.com.